Let’s face it, who has time to call for appointments. We are a “now” generation for instant results, self-generated reminders, and online shopping. 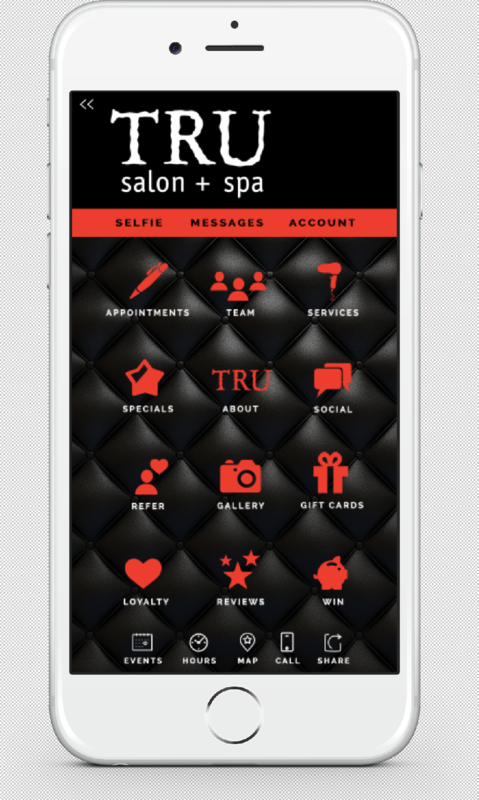 That’s why the TRU Salon + Spa mobile app was made for the busy professional in mind. Our mobile app allows you to choose your preferred location, day, and time that best meets your schedule all at your fingertips. You will even receive an appointment reminder right from the app. With our easy-to-browse menu, you have all our beauty and spa services right on your device to learn about and add onto your visit. We make shopping easy with an online store of all our professional product lines. View, choose, and buy all on your mobile app. You can even purchase a gift card for that special someone and have it delivered right to them! At TRU salon + spa we believe in giving back. Every time you visit, you will receive points in our Guest Rewards program. You also earn points with product purchases, referrals, and more. You can use these points as cash toward future skincare and hair product purchases or use in our boutique. We believe in not only making your hair, and skin more beautiful .... but your day-to-day easier with our mobile app. You can download the app for free from iTunes, Google Play, or Amazon. Have questions for our team at TRU Salon + Spa? Give us a call at one of our two locations - Branchburg, NJ (908) 218-9878 or Warren, NJ (908) 753-9878, book online.